His shoulders droop and his belt is clasped loosely around his waist. 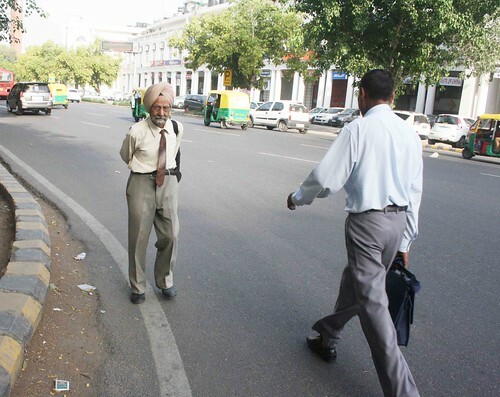 The Delhi Walla meets Abhay Singh, 86, in Outer Circle, Connaught Place, the city’s Colonial-era commercial district. It is early morning and the office commuters still haven’t invaded the streets. Mr Singh is carrying a leather bag on his back. 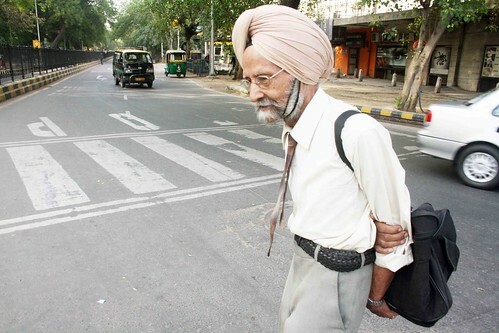 A Sikh, his turban is pale brown, his beard is white and his shoes are polished black. “To Golf Links. I work with the Red Cross Society,” Mr Singh says, referring to the voluntary humanitarian organization. 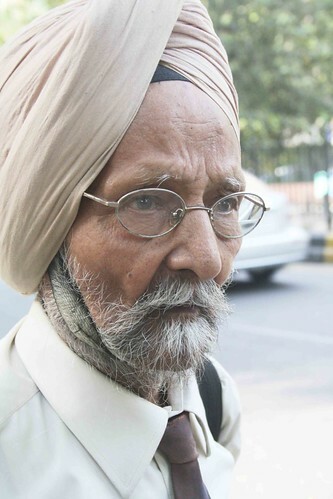 He has been living in Delhi for 50 years. He grew up in Amritsar, Punjab, and moved to Delhi after being hired by a government department. “I was an investigator of buildings,” he says, while walking slowly towards Scindia House. 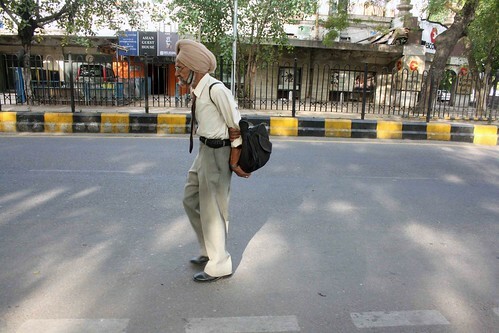 A man walks past, looking at Mr Singh with wonder as if how could such an old, frail man walk without support. 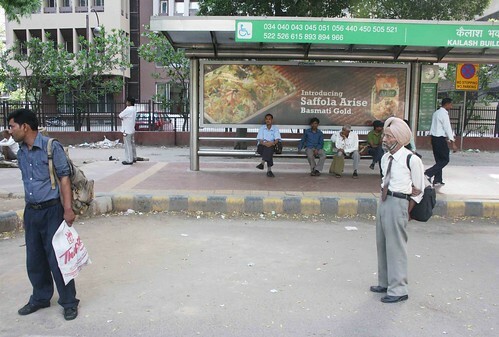 Every morning Mr Singh takes bus 990 from near his home in Rohini, at the tip of west Delhi. 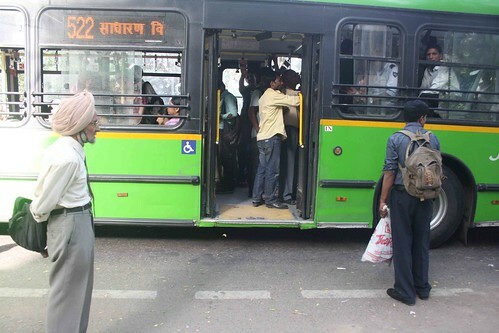 The bus drops him at Shivaji Stadium in Connaught Place. 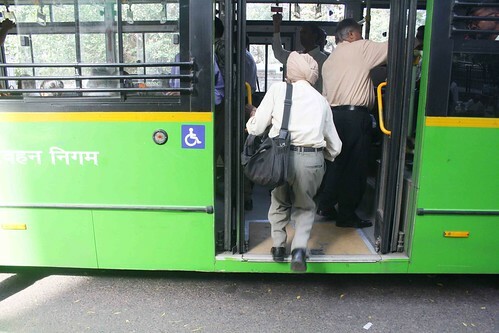 From there he walks about a kilometer to the bus stand in Scindia House, Kasturba Gandhi Marg, where he waits for 450, which takes him to his office in Golf Links, one of Delhi’s most posh neighbourhoods. “I live alone,” Mr Singh says. “I dust my house in the weekend. 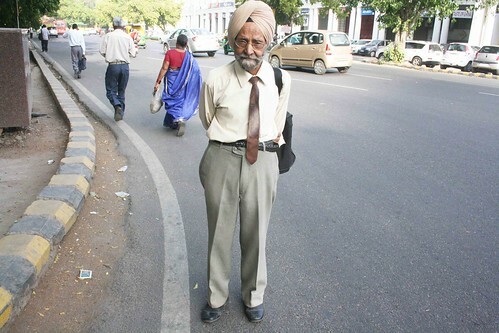 My clothes are washed daily by a neighbourhood laundry man but I iron them myself.” Looking down at his creaseless pale-pink shirt, he says, “When there’s a collar, I have to wear a tie.” Mr Singh has lunch in the Red Cross canteen. In the evening, he dines out at an eatery near his home. He prepares his own breakfast: toasted brown bread, cornflakes with milk and a cup of tea. Mr Singh’s wife, Devinder, died 25 years ago. She was a teacher. One of his two daughters, too, is a teacher. The other is a bank manager. Both live in Delhi. The son runs a tea estate in Assam. We reach the Scindia House bus stop. No sign of 450. Why doesn’t Mr Singh live with his children? “What will I do with them?” he says. “My children worry for me. They won’t let me go out of the house. But I need to keep myself active.” The children checks on the father regularly. Mr Singh’s home has two bedrooms. Does he miss his wife? After thinking for a while, he says, “I keep myself busy.” Does he feel lonely? “No,” his reply is prompt. “Much of my time is wasted in commuting. Four hours.” Just then 450 appears at the turning. Mr Singh gets ready to board the bus. salute, sir! what a man!! Great Example for young generation. I don’t have words to praise the spirit of this old main. A true self reliant, iconoclast person…!! !